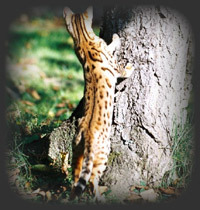 We try hard to breed healthy, pure Bengals, who bring a lot of joy with their enchanting nature. We want to make a contribution to the continuation of this beautiful race and not simply multiply it. Breeding does not mean to merely mate tomcats with cats. A responsible breeding requires knowledge about heredity, genetics, health as well as time, money and luck. As breeders we never cease to learn and we strive for the well-being of our cats and their babies. Aimless reproduction of race cats or their half-breeds in the hopes to sell their young animals usually only increases the misery of the far too many young cats of no race or pedigree. Also a contribution to a healthy race is for examination for diseases such as cat epidemic, coronavirus (Feline Infectious Peritonitis, FIP), cat colds and herpes. All our breeding and domestic cats get examined yearly. They get dewormed regularly and inoculated against cat epidemic, colds, rabies and leucosis. Our animals can move around freely in the entire house. Playing and cuddling with them as well as lots of fresh air and high quality nutrition go without saying. We are members of the TICA and of the BDCC.